Sale in Stock, BUY NOW!! A strikingly beautifully simple modern fireplace surround. This contemporary mantel sophisticated profile and front view. There are straight lines with a recessed central design. The stone of choice with white marble. It can also serve wonderfully as a cross over transitional mantel. 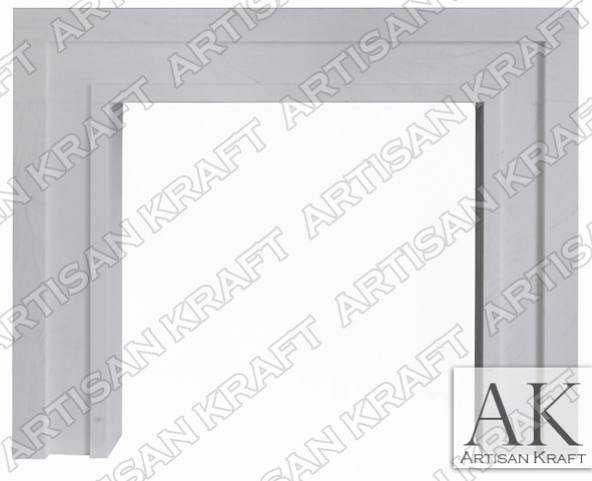 One of our many new modern surrounds offered to you exclusively by Artisan Kraft. We have an office in Los Angeles, California and a large fireplace showroom in Chicago, IL. Please give us a call or email us to setup an appointment to visit. Pictured in Statuary White marble in a polished finish.